It’s time to step up the game in how we celebrate our mothers. As the countdown begins to the release of Nigerian artist Tjan’s forthcoming single and video titled “Hey Mama”, Right Entertainment and Tjan are giving 13 fans the opportunity to create new memories with their mothers and win incredible prizes in the #HeyMamaTjan giveaway! 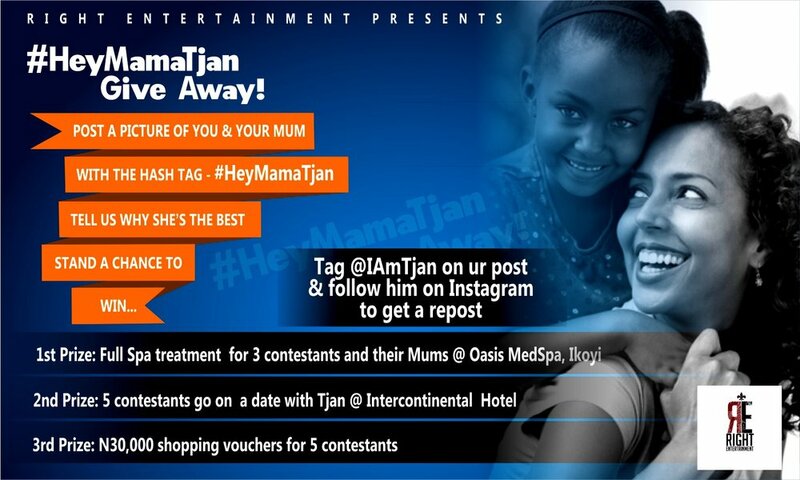 For your chance to win either a fining dining experience at Intercontinental hotel Lagos, a shopping voucher worth N30, 000 or a spa treatment at Oasis Medspa for you and your mother, upload a picture of you and your mum on Instagram or Twitter, stating why she’s the best and use the hash tag #HeyMama and #HeyMamaTjan in the caption. Included in the prize is an opportunity to hang with the “I Love You So” crooner, Tjan! Tjan is set to release his new single in the next two weeks. For updates on the competition, follow the singer on Twitter and Instagram: @IamTJAN.